This week's roundup covers play from the period of January 4-10. For the full list of Red Sox prospects participating in offseason action, check out our Fall and Winter Leagues page, which will be updated continuously through the end of the offseason. Aneury Tavarez saw quite a bit of action this week, as Estrellas move to 4-8 in the Round Robin playoffs. Tavarez was 8 for 22 with a two run home run in six games this week. Roman Mendez made three appearances this week for Toros, hurling 3.1 innings, allowing two hits and three walks. Sandy Leon went 6 for 15 with three RBI as he helped Aragua to a 4-3 series win over Margarita. Leon was 2 for 3 with a triple and two RBI in the pivotal game seven victory. The Round Robin playoffs began this week, and multiple Red Sox prospects saw heavy action. Christian Vazquez went 2 for 10 in three games this week for Santurce, who went 2-3. Bryce Brentz ended his week 5 for 15 with a double, two runs scored and two RBI. Rusney Castillo made his offseason debut, and was 1 for 4 with a triple and two RBI in his first contest. Castillo closed the week by going 0 for 12 in his final three games. 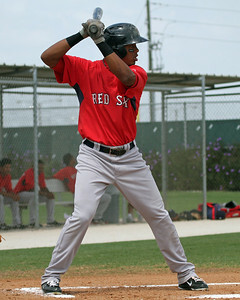 Caguas' lead off man Henry Ramos (pictured, above) got off to a great start, going 4 for 4 with two doubles and an RBI on Monday. Ramos finished the week by going 3 for 11, as Caguas finished the week 2-3.